Daniel Harris-Lucas, 23, and Diana Busaka, 22, are name San Jose State University's first African-American homecoming king and queen. The oldest state university in California, made famous during the 1968 Olympics when two San Jose State University students raised their fists in a “Black Power” salute, has just named its first African-American couple as homecoming king and queen. Seniors Daniel Harris-Lucas, 23, and Diana Busaka, 22, were given the honor Thursday night out of 24 applicants. According to Dona Nichols, an SJSU journalism professor and a member of the homecoming judging panel, said there has been an African-American queen before, but never a duo. African Americans comprise roughly four percent of the 34,000 students who attend the school, whose mission statement formally touts diversity. Despite the low number of African Americans at the public school, two former students put SJSU in the history books forever -- a large statue of Tommie Smith and John Carlos still stands prominently on campus today. The pair each raised a black-gloved fist during the 1968 Olympics in Mexico City during the American national anthem. Smith took first place in the 200 meter race with a world-record time of 19.83 seconds. Carlos took third place with 20.10 seconds. Their “human rights salute” is regarded as the most overt political statements in the history of the Olympic Games. With that legacy behind them, Harris-Lucas and Busaka are now part of SJSU campus lore. And they won an honor that wasn't judged on popularity. Applicants submitted resumes, personal statements and letters of recommendation. Nichols said their applications were a "slam dunk." Harris-Lucas is a public relations major who grew up in foster care and has mentored youth in Oakland, and volunteers at his church, Bethel AME in San Francisco. Busaka is an occupational therapy major as well as a student ambassador for SJSU, and is also a resident advisor and a mental health liaison. She was born in Kenya and lives in Los Angeles. 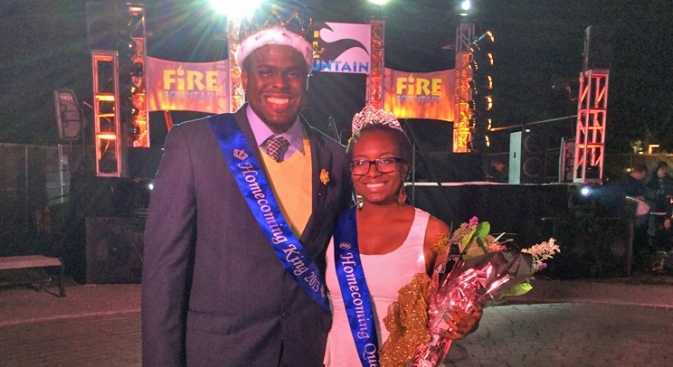 The homecoming king and queen are expected to ride on a float during halftime on Saturday during the Mountain West Homecoming game between the SJSU Spartans and the Wyoming Cowboys. Kickoff begins at 4 p.m.
EDITOR'S NOTE: Lisa Fernandez is an adjunct journalism professor at San Jose State University. Dona Nichols used to work at NBC Bay Area.